TACLOBAN CITY – The region’s nominees for the Lupong Tagapamayapa Incentives Award (LTIA) has been announced by the Department of the Interior and Local Government (DILG). LGMED Asst Div. Chief Johannes Dorado & ARD Aida Laruda talks with Lupon of Brgy. San JUan, San Isidro, Northern Samar. Brgy. Hingatungan, Silago, Southern Leyte (4th - 6th class municipality category). Brgy. 88 in San Jose district topped the evaluation of top performing Lupong Tagapamayapa in the region's only HUC, Tacloban City. Liloan in Ormoc City bested Brgy. Bato in Borongan City (which was competing as a component city barangay after having been the regional nominee in 2009 for 1st to 3rd class towns); and Brgy. Combado in Maasin City. In the 1st to 3rd class municipalities, the other regional finalists were: Brgy. Biasong in Hinunangan, Southern Leyte; and Brgy. Dalakit in Catarman, Northern Samar. Among 4th to 6th class towns, the other finalists were: Brgy. Bulalacao in Kawayan, Biliran; Brgy. Nena in San Julian, Eastern Samar; Brgy. 4-Poblacion in Balangkayan, Eastern Samar; and Brgy. San Juan in San Isidro, Northern Samar. The RAC is led by DILG with the participation of the RTC Executive Judge, Regional State Prosecutor, Philippine Association of State Universities and Colleges, private schools, among others. The RAC assessed the submitted documentation of regional finalists together with the results of the regional evaluation team which conducted onsite validation of the coverage period, from 2nd semester 2009 and the whole of 2010. 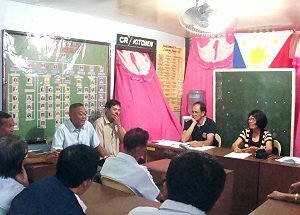 The lupons were evaluated by committees organized at the regional, provincial and municipal levels on the basis of a) efficiency of operations; b) effectiveness in securing the katarungang pambarangay objectives and c) creativity and resourcefulness of mediators.